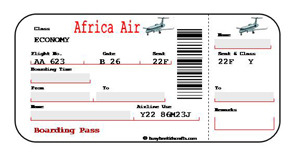 This pretend Africa Boarding Pass is a fun souvenir from an imaginary trip to Africa. There's spaces to write in your own name, city, destination and boarding time- great writing practice! * Instructions for Printing: The template will open in a new window; close this window when you are done printing to return to the activity page. You will need Adobe Reader to open the template. If you do not have it you can download it for free here. 1. Print out the boarding pass, and cut around it. 2. Fill out the information on the pass; there are light gray rectangles in the areas that need to be filled in. 3. Board your flight to Africa!